(10-03-2018, 06:50 PM)Minamikaze Wrote: The problem is this word is taken from the line that describes a *process*, not the *requirements for a process*. Of course I can translate it as 'Needs', 'Materials' and anything else I think fit, but then my orcs would state that they are, indeed, Needs or Materials, when they are going to produce weapons. And I highly doubt that any reasonably inflected language can manage to use the same wording for both a process and its conditions. Yeah, I had the same problem with that word and I'm not happy with transforming a word "Crafting" into the "Need" in my translation though. Actually do we even need any word placed before resource icons? Just seeing that there is 0/10 tells me that 10 units of certain resource has to be delivered to the construction site, icons tells what kind of resource it is (however a small text tooltip could highlight what exactly is this resource). If there was however a need to explain it the tutorial campaign that is already being in development could tell the player something like "deliver 10 stone to construction site in order to finish the Stone Bridge". I noticed not only word "crafting" is simultaneously used in two places (on construction site and in crafting menu), but also the same phrase "Creating game..." is used when you generate new map or start a new game, which IMO makes difference, because I would rather separate this phrase on "Generating new map" and "Creating new game". Just a small update. Due to some business I have to attend to, my free time is not what it used to be. Nevertheless, the translation is aprox. 70% done. So, a little update here. I've not forgotten about my translation, but there is plenty of work here. Perks of going freelance, I suppose. However, I'm planning to return to this project on April 21-22 no matter what and finish it at last. Only the lines 1142-1372 remain and at least half of them are quite easy to do. Good news is I even managed to adapt achievements, keeping as much of tongue-in-cheek humor as I could (although I will revisit this section once more to get a clear sight). Also, Antroot is Кривокорень now, literally meaning "Twisted root", which looks fine and takes about the same symbols. In any case, I'll go over the text and in-game representation tomorrow, to assess it with a fresh eye, and then I'll try to make a commit according to your instructions. Btw. also make sure that you have the latest English translation (I updated it a month or so I think). It seems I need push access to your GitHub. I don't know how this system works, but here's my profile: https://github.com/Seknor. Yep, latest translation. And there is no rev 2 in line 348 either, so I dunno what the program uses as the basis for comparing. "Initializing" and other system messages before the game is loaded. Something with charsets maybe? Race isn't translated (for every creature that is). And, of course, the already discussed matters with crafting room (no translations, just old metalworks strings) and so on. Log in to GitHub and edit the Russian.xml, than when you're done search for "Pull request" green button somewhere, than after that search for it again to confirm sending request. If it comes to missing "rev 2" it's in line 1119. It seems many lines are doubled, so we have one "crafting_room" in line 348 and second "crafting_room" in line 1118. Rasmus - would it be possible to make Language Checker showing lines in which any warning occur? So instead of "WARNING: "buildings:crafting_room" has a outdated revision number." we could have "WARNING: line 1188 "buildings:crafting_room" has a outdated revision number."? These issues will be fixed in the upcoming version. (23-04-2018, 02:47 PM)Minamikaze Wrote: Made a fork. 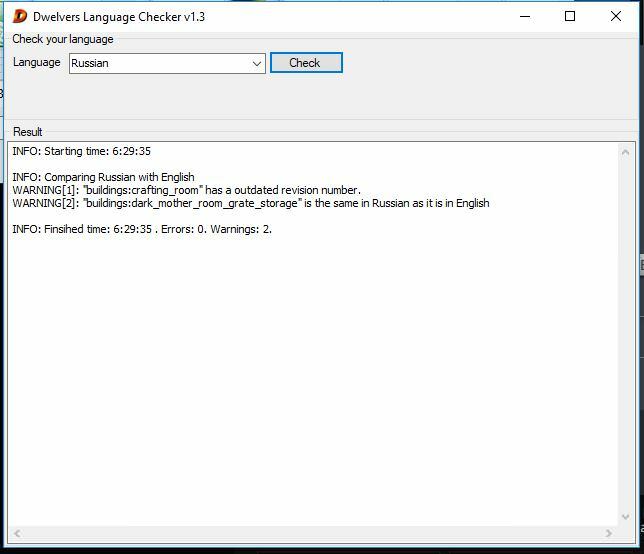 (24-04-2018, 08:33 AM)Sebt Wrote: Rasmus - would it be possible to make Language Checker showing lines in which any warning occur? So instead of "WARNING: "buildings:crafting_room" has a outdated revision number." we could have "WARNING: line 1188 "buildings:crafting_room" has a outdated revision number."? I'll try. The xml reader library that I use don't support line numbers, but I will try to find another way. I'm pretty close to finishing it. Then I just have to go trough a nice long play-trough and adjust stuff (you know, just to be sure stuff is ok). The Spanish translation is finished! I have tried to upload the translation to GitHub but it says that I do not have "push access to this repository". I made some testing to make sure the translated terms fit properly in text boxes. The only problems I have seen so far are that the room names within sentences are capitalized (which in Spanish is incorrect), and that the subtitles in the game tutorial are not properly separated in two sentences (since it is automatically done). Is there some way to manually insert a line break? Also, as somebody said before, the race and metalworks room translations are not shown. Well, Romanian translation is done. I am currently testing to see how it looks in game. 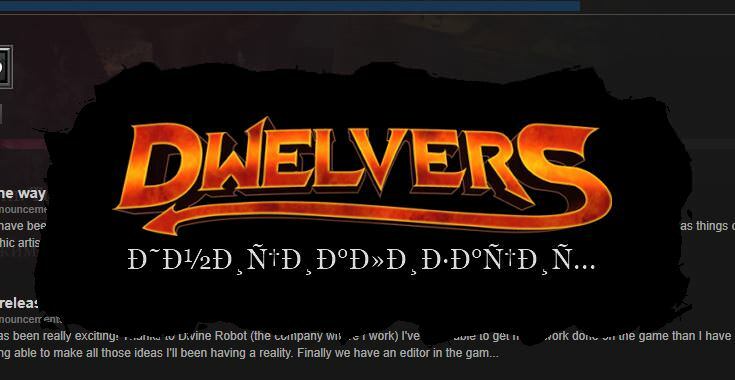 For some reason the splash screen is still not happy with some special characters. And, I've also encountered some of the issues @Eric mentioned above. Current time: 22-04-2019, 12:04 PM Powered By MyBB, © 2002-2019 MyBB Group.